About decorative and finishing properties of natural stone - limestone - known since ancient times . Even then trim them primitive man his home . Time has passed . Until now, this rock is used in the construction work . And all this was made possible thanks to the properties of this mineral , which is characterized by durability, decorative, color purity, uniformity of structure , ease of processing. Experts note and little-known quality limestone , such as environmental and thermal insulation . And it has healing properties - can even clean the air in the room and fight bacteria . Our ancestors believed that this mineral is able to promote health and even cure . The main purpose of this material - limestone cladding , it has found widespread in the construction industry and landscape design . Tiled limestone veneer facades of buildings : private houses, restaurants, shops, buildings of different services and organizations , including government . During the restoration and reconstruction of important cultural significance of objects - monuments also used limestone, which restores the original form of the building , thus retains its historic appearance. When facing facades typically use tiles with smooth or embossed surface. You can also play with color, using limestone gray, white , brown colors and shades . When laying the stones used several ways , including by seamless technology . Tiles are placed so that the interface between them is almost nowhere to be seen , however , the surface becomes like a flat stone wall. If we imagine that the installation is carried out basin , the result will exceed expectations - guests will not even know what it was made . Another method of laying a white stone - stone tiles installation with the seam on both sides . Wall faced thus gives the impression of long strips of solid limestone. 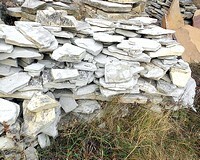 When facing limestone used and the various elements of stone. Making a sculpture or other small architectural forms makes various objects unique and aesthetically appealing . Made from limestone carved trim on the windows, framed by arches and columns with gorgeous consoles and bases , stairs and railings . In order to make the building a unique architectural style appropriate , without these elements are indispensable.